After getting a few things done around the house Sunday morning, I had some lunch before the call of the river had me heading to the South Branch to wet a line. The last few nights had been very cool, and that day we had high thin clouds filtering the high sun and perfect temperatures for October in August. After getting set up, I took the water temperature and it was a comfy 65 degrees F. This is one of my favorite times of the year to fish - water and air temperatures are such that you can literally immerse yourself in the river by wet wading. I started well above the Ken Lockwood Gorge section of the river intending to work my way down into the gorge and then back up. I really had no goals in mind except to take a long walk/wade in the river on a beautiful day and take in the sights and sounds of the woods; and if a trout should take my fly that would be icing on the cake. Initially, I had an iris caddis on the end of my tippet, which I fished wet. I took a couple of rainbows in the first few runs and as I was moving down to fish the next run, a fish rose on the far bank under a clump of multiflora rose bushes overhanging a soft spot in the current. I quickly cut off the iris caddis, changed tippets to a long 6x, and tied on a #20 Matt's Gnat. 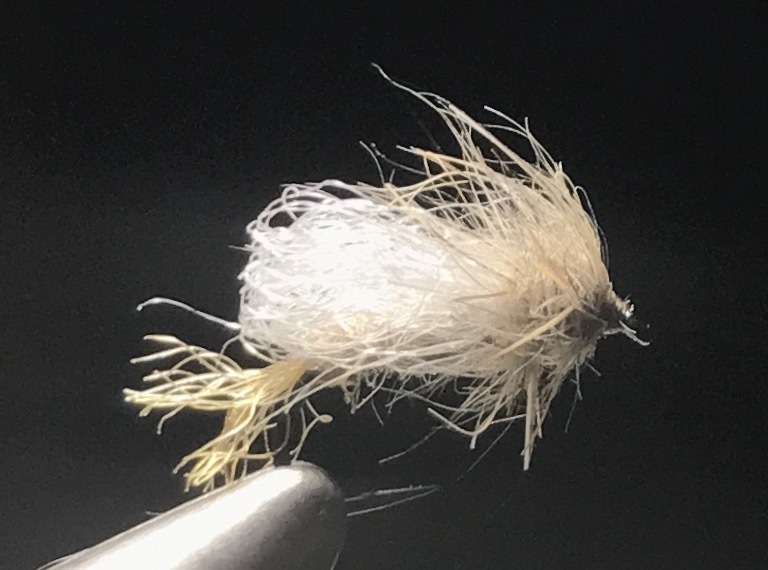 This is my go-to fly when I don't see anything on the water and conditions are such that subtlety is required - slow, clear water flowing like it is thicker than it really is. I cast the fly well up above where I saw the rise to get a read on how it looked and floated on the water, before lifting and making a couple of quick false casts and then dropping the fly above the fish. The fly floated along unmolested, so I picked it up and in one motion dropped it a little further above the first spot. It drifted less than a foot before it was grabbed by a wild brown that after a brief battle measured about 8 inches long. From that point on decided I would only fish the dry for the rest of the outing. Over the next 4 hours I waded and walked (around other anglers) my way to the bottom of the gorge before turning and heading back up river. I fished only the shallower riffles, runs and pockets that most anglers pass on and took quite a few rainbows and wild browns, nothing over 10 inches. As I moved along, I dropped the fly in every foam line that flowed below rocks over the darker river bottom made up of small cobble and stone. I rarely saw the trout, as they blended in well with the bottom. It was all about making a solid first cast along with the knowledge/confidence that many of these runs held at least one fish. I fished this one fly the whole time, retying it on to the tippet after every few fish, and I don't think I made a cast over 20 feet. 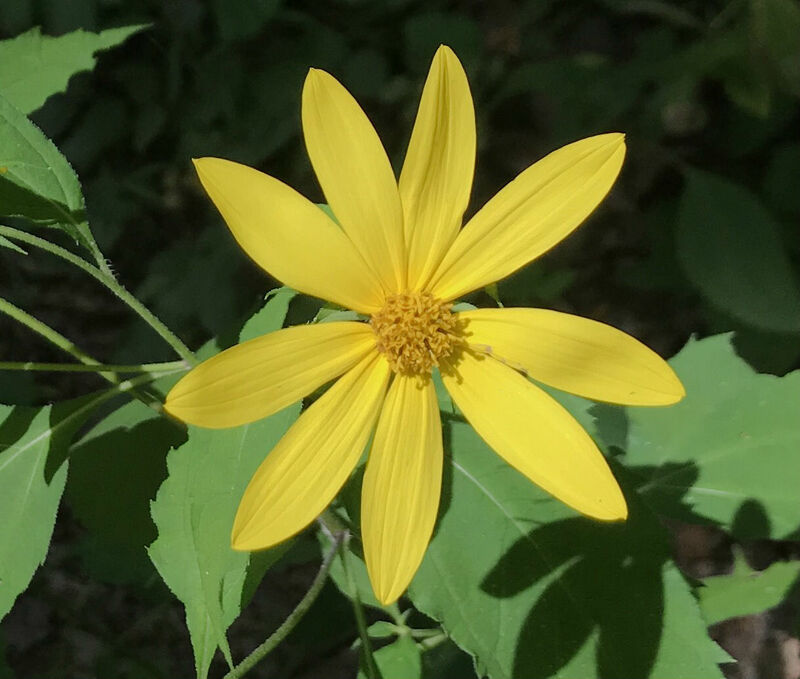 It was one of those days that is very satisfying, not only because of the weather, but especially because my low expectations were met with good results. As I wrote a couple of weeks ago, Doug Freemann and the rest of the US Youth Fly Fishing Team, competed in Slovenia last week against 12 other International Teams. 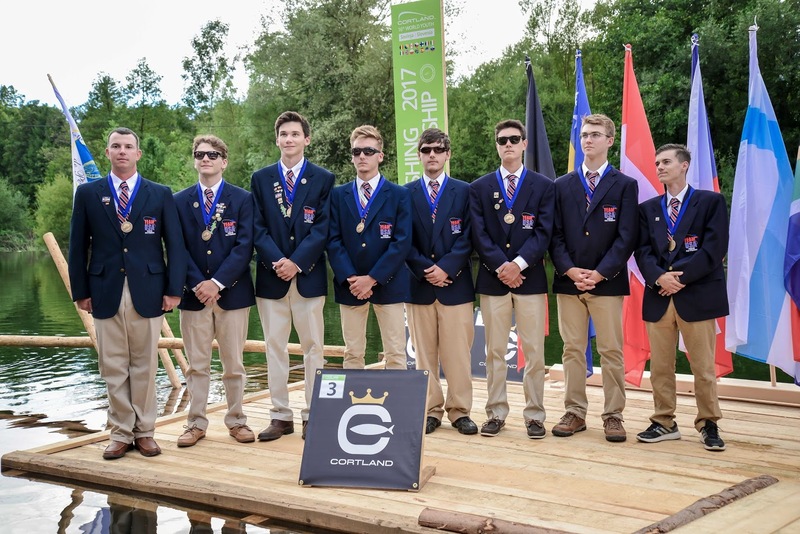 Despite tough conditions on new waters, they finished with the bronze medal. France took gold, and Poland took silver. Congratulations team USA! As I write this, Douglas is beginning a new chapter in his life. He just texted me that he is moving in to his dorm for his freshman year at Colorado State University. Good luck, Doug, and make sure you study as hard as you fish! 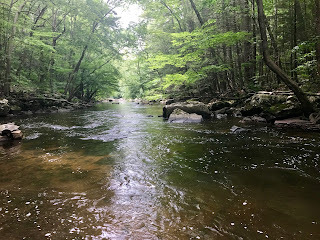 I parked my car at Hoffman's Crossing bridge and walked the half mile down to the top of the Ken Lockwood Gorge, where I took the water temperature just to be sure it was good to fish. The thermometer read 65 degrees F, and the water level was very good for this time of the year. As I walked down the rutted dirt road that skirts the east side of the river, I looked for bugs and rises without much luck, so I tied on a size #17 Iris Caddis and then added a small split-shot about 8 inches above it, intending to fish the fly as a nymph. I stepped down to the river and began casting the fly into a short, deep pocket. 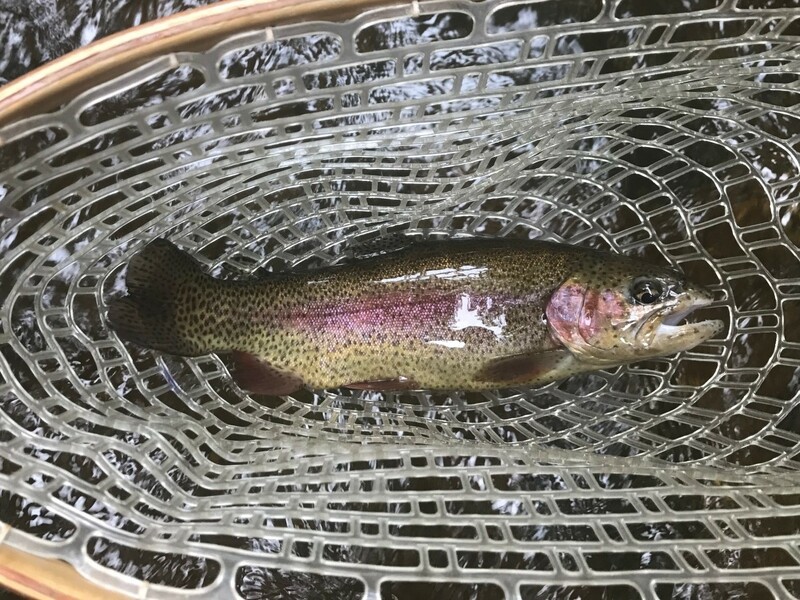 It only took a couple of casts before I was into a 12 inch rainbow. 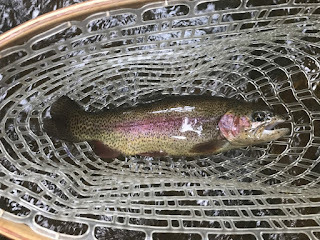 I took one more rainbow in that hole and then started to work my way downstream hitting every pocket and run that had some depth and a "fishy" look to it. Over the next few hours of working my way downstream, I took several more rainbows and even a couple of small wild brown trout. All of them on the same Iris Caddis I started out with. I did see a few other anglers as I made my way down river, but everyone was spread out and only a few times did I have to get out of the river to go around someone to leave them a wide berth. The air temperature stayed comfortable and it was a pleasure to wade in shorts without waders. The gorge is very rocky, and even when the water levels are low, you do need to wear wading boots with felt or studs to be safe. I covered about two-thirds of the gorge before turning around and heading back towards the top, stopping at various holes and runs, and fishing them. It was a hatchless morning, and during the entire time I saw only one rise. So I fished the same fly the whole time and did well, including catching a beautiful 6-7 inch wild rainbow just before calling it a day around 2:00 PM. 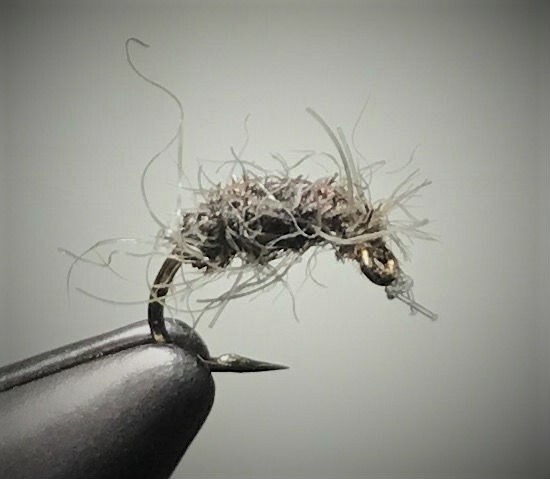 A size #17 Iris Caddis tied on a TMC 102Y hook.